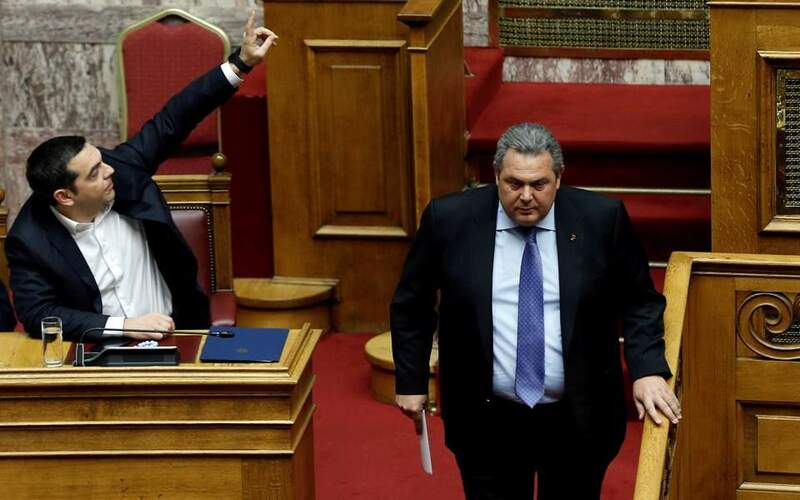 Breaking the calm before the inevitable storm, erstwhile allies Prime Minister Alexis Tsipras and Independent Greeks leader Panos Kammenos crossed swords on Friday during a heated Parliament debate which ended with the ratification of “North Macedonia’s” NATO accession protocol with 153 for and 140 against. For his part, Kammenos described his former partner of four years as a “cold assassin,” blaming him for his party’s parliamentary dissolution. With the resignation last night of MP Thanasis Papachristopoulos, ANEL’s parliamentary group has fallen below the minimum of five MPs. His seat will go to Terens Quick, a deputy foreign minister. “Prime Minister, you have committed a crime. I take responsibility for myself, but when it comes to ANEL, it is a crime I will never forget. You have decided to silence us,” Kammenos said, turning to the prime minister. He also accused Tsipras of bribing former ANEL MPs to jump ship and side with the government in last month’s vote to ratify the Prespes accord in exchange for a ministerial post. He accused Tsipras of siding against him with Turkish President Recep Tayyip Erdogan and German Chancellor Angela Merkel. “You ought to have the sensitivity to respect principles,” he said. He also said that his party will not relinquish the right to veto the accession of the neighboring country to the European Union once the process gets under way. “The negative consequences [of the deal] will have to be mitigated measure by measure, day by day. And I repeat once again: I do not forgo the right to veto Skopje’s accession to the European Union,” he said, adding that while ND does not object in principle to FYROM’s entry into NATO, it opposes granting “Macedonian” ethnicity and language to its neighbor.